Photo by Michelle Cooper Galvin. 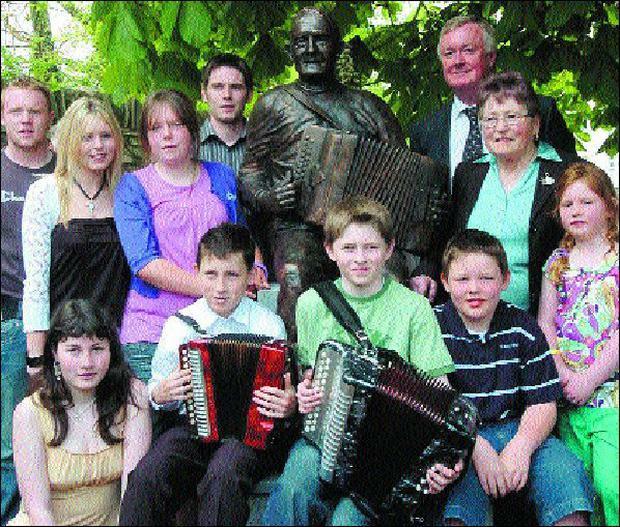 THE memory of one of Ireland’s greatest traditional Irish music players, Johnny O’Leary, has been honoured with a bronze statue in Killarney town centre. The bronze statue of Johnny, by Castleisland sculptor and friend Mike Kenny, was unveiled at a ceremony in Killarney on Saturday by Arts, Sport and Tourism Minister John O’Donoghue. Johnny’s wife, Lil, daughters Ellen and Maureen and his son Sean were present for the occasion. Born in Maulykevane in Gneeveguilla in 1923, he was one of the strongest links to the golden era of the Sliabh Luachra music tradition made famous by his teacher and master, fiddle player Pádraig O’Keeffe, and playing-partner Denis (The Weaver) Murphy. By his early teens, Johnny O’Leary had embarked on a musical career that would result in numerous recordings, radio and television appearances and win him several accolades and awards. His last national achievement was a TG4 ‘hall of fame’ award. Speaking in Killarney on Saturday, Minister O’Donoghue said that when Johnny O‘Leary passed away in 2004 at the age of 80, it marked the parting of an era but, from now on, it is an era that will not be forgotten by anyone who passes by the spot on Kenmare Place where the life-size statue stands. Sliabh Luachra, the minister said, is a remarkable place that has produced more musicians for its size and population than any other part of Ireland. It was there that Johnny spent his life honing his musicianship and playing his richly distinctive music. Some say that in his capacity to make a melodeon sing, Johnny was touched by God, inspired by the Two Paps, Tureencahill and the rushes in Reaboy, and immortalised by sheer individual genius. “Johnny started picking up tunes on the melodeon at the age of five and by his early teens he was playing regularly at local dances. Tadhgy Willie’s Hall in Gneeveguilla revelled to Johnny’s music and no stations, American wakes or house dances were complete without Johnny reeling off the jigs, reels and hornpipes,” the minister said. “By the time he was 15 he had struck up a musical partnership with Denis the Weaver (Murphy) that was to last a remarkable 37 years, ending only with Denis’s untimely passing. Julia Clifford was also a regular accomplice at sessions – spontaneous or otherwise and always memorable,” he added. In 1964, Johnny and Denis accepted an invitation to play in Dan O’Connell’s newly opened pub in Knocknagree, and for the rest of his life Johnny played there every Friday and Sunday night — making it a veritable mecca for set dancing pilgrims from around the world. He was always regarded by discerning dancers as a joy to dance and listen to. He could inject an infectious energy into the music without indulging in speed for its own sake. It is said that Johnny’s music had the capacity to wash away from the soul the dust of everyday life. Johnny’s music featured regularly on Mo Cheol Thú and the Job of Journey Work on Radio Éireann. Johnny was no stranger either to television, appearing on Bring Down the Lamp and Come West along the Road on RTÉ. Today, Johnny is spoken of in the same breath as the other titans of traditional music.